The Point of Sale (POS) market is like most that are highly regulated with a high barrier for entry — it is dominated by a few players that have the capital and resources to invest and be successful. Innovation comes slow in these types of environments because there are frankly too few brains working on the issues and problems. Innovation happens best when there are thousands and thousands of brains thinking of new ways to do things better. What is needed to change these markets is a disruptive way of doing things… something that sparks innovation. For instance, the Internet of Things (IoT) is often thought of in terms of some very Jetson like antidotes, such as the refrigerator or pantry ordering groceries when needed. But, probably the most important and immediate benefit of IoT is in the industrial space where it will provide an entirely new and relatively inexpensive way of gathering data from industrial systems that until IoT could only be done by very expensive monitoring and control systems dominated by only a few major companies. By conservative estimates, it is believed that these IoT systems will allow triple or quadruple the amount of data to be gathered from industrial processes. Through data mining, vast efficiency improvements can be made to those industrial processes – this has been called the “next” industrial revolution by many. The most fascinating thing is that most of this next revolution innovation will come from companies that did not exist two to three years ago. IoT was the spark that broke the barrier for entry into this market, one that has not fundamentally changed in the last 50 years. For the POS market, the biggest barrier to entry is the arduous certification process that a device must undergo. There is the Payment Card Industry (PCI) certification to securely handle Personal Identification Numbers (PINs) and the account information of the purchaser. Then on top of that is the Europay, Visa, Mastercard (EMVCo) certification required by the credit card companies to assure the transaction is properly handled per their individual requirements. Near Field Communication (NFC) has multiplied these certifications due to each card company requiring their own separate certification. This leads to each device having to pass at least one PCI certification and one EMV certification for Contact (or Chip) cards as well as the number of EMV NFC certifications equaling the number of different credit cards supported. This represents a roughly $250,000-$300,000 investment and 12-18 months… if you know what you’re doing. To spark innovation in the POS market, these certification barriers need to be significantly reduced. Several silicon companies have produced market-ready POS reference platforms. And they look very slick… for a year or so anyway. The problem with these form factor-ready reference designs is that they typically represent the state of the art of POS two years in the past since it takes at least 1-2 years to make one of these types of devices. Remember those PCI and EMV certifications? Well those standards probably changed quite a bit in 2 years. Also, since it is in the actual form factor of a payment terminal, it most likely looks like something that is already mainstream, which is not likely to be innovative at all. Since any developer at the end of the day is developing their own product with their own special sauce they will need a development system. That development system is certainly not the form factor reference design. So once you get past the shiny exterior of these point of sale reference designs, you are left with an out of date, non-innovative platform that you can’t do much with. While certainly not claiming to be as far reaching as IoT, my colleagues and I here at NXP have been working on a way to spark innovation in the POS market by developing what we call the Point of Sale Solution Reader (SLN-POS-RDR). 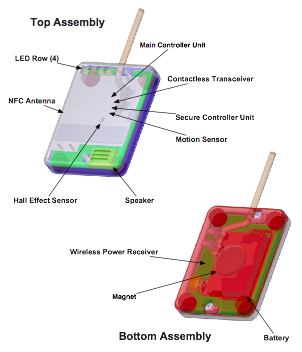 It is NOT a form factor-ready reference design. However, it is first and foremost a Point of Sale development system, and we’ve done most of the hard work of putting together the hardware and software necessary to pass PCI and EMV certifications. We’ve certified the PIN pad as a 4.1 PIN Entry Device (PED) and pre-certified the NFC and Contact cards for EMV, and we’ve put together the majority of the software building blocks to make a POS terminal. Some may say it’s not pretty, but to an engineer trying to add payment to his idea, it is beautiful! Below is an example of how our SLN-POS-RDR allowed a small innovative company called Flomio to create a new kind of payment device which they call EASyPOS. Think of it as a combination of an asset security tag and a payment terminal. 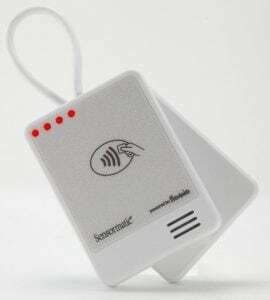 A person simply taps the tag with their smart phone with Apple Pay or Samsung Pay, receives a green light indicating the transaction completed, removes the tag and places it in a bin on the way out. There is no need to hunt through the aisles to find a sales person or to wait in a check out line… the very definition of instant gratification! Flomio was able to take our SLN-POS-RDR and develop their first EASyPOS prototype in 2 short months! Now that is sparking innovation! We will be showcasing the Point of Sale (POS) Reader Solution at TRUSTECH, November 29th – December 1st. Come by the NXP booth and we will show you how we can help spark your next innovative POS design. Grab the product you want to purchase. Place your Contactless Payment credential on the surface of the contactless payment logo and wait for 4 LEDs to blink green. EASyPOS is now disarmed. Slide apart the magnetic halves and remove from your purchase. The EASyPOS was built by Flomio, an expert in mobile NFC device design. 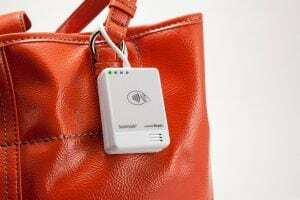 It operates at very low power while actively monitoring for payment engagements, remote notifications, tamper attacks, and location changes throughout the retail environment. Smaller than a deck of cards, the EASyPOS is a payments certifiable device that leverages the hardened security and miniaturization advances of NXP Semiconductors. It is split into two assemblies, the top hosting active components like the freakishly loud 90dB speaker and the bottom containing the wireless recharging power system. Disney’s Magic Band™ technology revolutionized their theme park business. Companies eager to “Disney-fy” their businesses without their own team of imagineers and billions to invest turn to Flomio, imagineers for the rest of us. Flomio creates proximity ID solutions that help enterprise clients and developers cross the chasm to the next web, the Internet of Things (IoT). Funded by TechStars, Flomio is fundamentally changing the way people engage with the spaces around them by making proximity ID simple to integrate, easy to deploy, and fun to use. Soon, 50 billion devices will regularly connect to the internet. Flomio’s platform empowers enterprise customers and developers to create applications that communicate with these devices. The future is ubiquitous connectivity. Flomio makes sure businesses take advantage of it.